Get revealing answers from successful mompreneurs who turned their skills, expertise and backgrounds into a business. Are you a mom who would like to create your own business, but you can't find a business idea that suits you? Would you like to pursue your passion while having the flexibility to WORK FROM HOME? 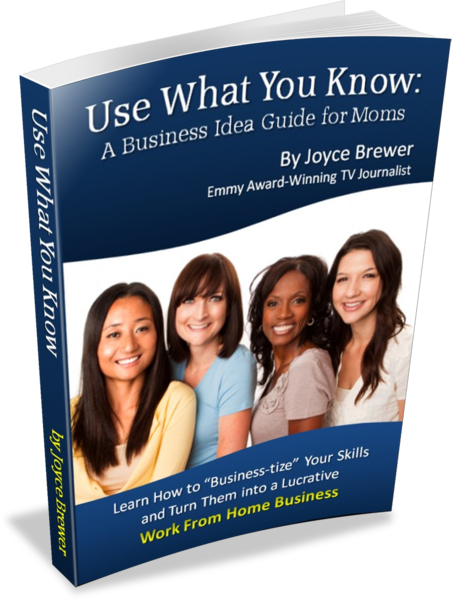 Learn from the successful mompreneurs featured in this book who created businesses using the skills, knowledge and expertise they already had. Read their insightful interviews conducted by an Emmy award-winning TV journalist who is know a work at home mom and parenting talk show host. Who’s featured in the guide? A mother of QUADRUPLETS (yes, she has four daughters) whose work is featured in a downtown Atlanta hotel. A mom who uses Skype to work with clients all over the world! A serial entrepreneur who has DYNAMIC networking advice and is a pro at getting things done! A mom who was inspired to create a business that’s PERFECT for moms who want flexibility while using their professional skills. A mother whose EXPERTISE was instrumental in the World Trade Center settlement. And an Emmy award-winning TV journalist who’s interviewed Oprah and appeared on ABC’s The View, then created a parenting talk show.